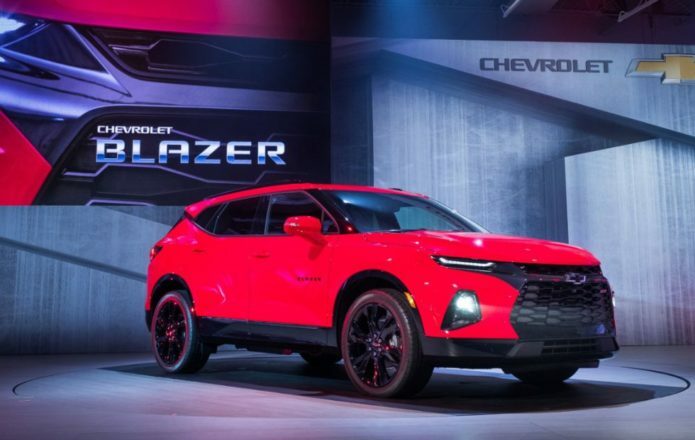 Does the 2019 Chevrolet Blazer deserve its name? The Blazer recipe is simple. Foolproof, you might’ve thought, even. The ruggedness of a work truck, tempered but not tamed with the pleasantries of a mainstream car. Chevy had the pieces of the puzzle right there in front of it, and the map of how they were all meant to go together, and it came up with… a jacked-up Camaro? Rewind a bit. The first Blazer carved out its niche with a simple formula: it had the underpinnings of an authentic truck, with a more practically-sized body and a cabin you could cruise all day in. Chevy may have diluted that over the years, but the core essence of what made a Blazer, well, a Blazer held true. What was announced this week isn’t a Blazer, by that recipe at least. Chevrolet has followed the herd and made yet another crossover, squeezing a five-row into the gap between the Equinox and Traverse. It may give you a more upright seating position than an unfashionable sedan, but under that sculpted sheet metal is the C1XX platform, itself a crossover variation on GM’s E2XX on which the Malibu is based. There goes, then, your genuine off-road abilities. Chevrolet will sell you a front-wheel drive 2019 Blazer, but even if you get the all-wheel drive version it will typically decouple its rear wheels in the name of frugality. The interior, meanwhile, owes more to parts-bin sharing with the Camaro and Acadia than anything else. Perhaps a removable hard-top was too much to hope for. Perhaps the economy police would always stop a big V6 or even a V8 from finding its way under the hood. Maybe, in fact, the modern world just isn’t ready for the Blazer name badge at all any more. It’s easy to get hung up on specifications when you’re looking at the Blazer. Certainly, on paper at least, the fact that Chevrolet dropped the body-on-frame design and went for a much more car-like SUV platform is a break with tradition. Four doors, too, rightly have some Blazer fans furious. Perhaps, though, we should be looking at why Chevy made those decisions in the first place. Focus, not on specs for their own sake, but as a means to an end. In that light, the strategy taken with the earlier, classic Blazer trucks seems a little different. In the case of the original Chevrolet K5 Blazer, released in 1969, the goal was to take on the short Jeep CJ and the Ford Bronco. That meant a more compact truck, keeping the ability to reliably deal with rougher terrain, but also marrying that with greater creature-comforts in the cabin. An automatic transmission, for example, and air conditioning. The second-generation Blazer pushed the luxe and convenience features even more, and as it progressed through several generations and – by the time the new model arrives – five decades – that trend toward a more car-like experience matured. The idea of a family-friendly, off-road capable vehicle that didn’t sacrifice the pleasantries of a traditional sedan no longer demanded gussying up a work truck. By the time we get to the 2019 Blazer, that journey has snowballed. Modern families want that same combination of reliable performance on the few occasions they’re away from the asphalt, and without sacrificing comfort or technology. Today, Chevy’s C1 architecture – also found under the Cadillac XT5 and GMC Acadia – can deliver that, along with the refinement we now expect from a modern crossover. In short, while it’s easy to get misty-eyed remembering the old Blazers we may have grown up with, Chevrolet’s 2019 version sticks to the ethos of the original, even if it breaks with some of its specifications. A modern Blazer for a modern family, then. The proof in Chevy’s pudding is likely to be sales. The 2019 Blazer won’t arrive at dealerships until early next year, by which point we’ll know not only pricing but have seen the entry-level versions too, not just the high-end RS and Premier. Expect the rumors already circulating about a Blazer SS with ~400 horsepower to have gathered pace by then, too. Meanwhile, Ford shouldn’t get too comfortable. The all-new Ford Bronco is coming in 2020, and its fans are going to be equally vocal.